Folk musician, Tim Laycock and Serpent player, Phil Humphries of the Melstock Band lead a series of workshops in autumn 2013 in the style of West Gallery Music. This style of music is the name describing the harmony songs that used to be sung in English country churches from the 18th century onwards. The music was vibrant and full of life and is accessible today to all singers and instrumentalists, from amateur to professional, as it was then. Workshops took place at Strangways Village Hall in Abbotsbury, attracting over 40 singers and musicians, and the project culminated in two sell-out carol concerts at St Mary's Church, Winterborne Abbas and St Nicholas' Church, Abbotsbury. 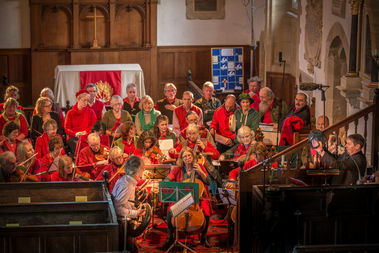 Following the success of these concerts, and a project exploring the folk songs collected by the Hammond brothers in the summer of 2014, the Ridgeway Singers and Band regrouped during the autumn of 2015 and, led once more by Tim Laycock and Phil Humphries, they explored West Gallery carols from the Puddletown and Pulham manuscripts. The performers also worked on two newly composed carols inspired by the Ridgeway, before giving two concerts over the winter. The concerts were also recorded and played via on Ridgeway Radio at Dorset County Hospital for patients to enjoy. When the project came to an end there was such an appetite from the fifty members that The Ridgeway Singers & Band continue to run independently, performing to sell-out audiences across the County at a variety of events and festivals. 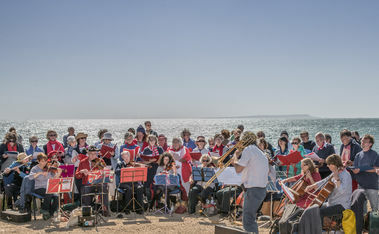 Find out more about the Ridgeway Singers & Band.